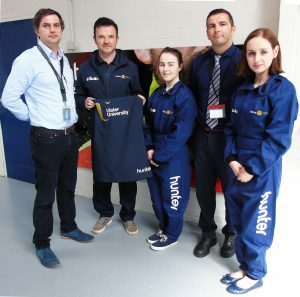 Hunter recently designed and donated a range of race PPE for a group of second year students, University of Ulster, Magee, who have a real passion for design, manufacturing and advancements in technology. These students recently took part in a Greenpower challenge. Greenpower Education Trust is a UK based charity which gets young people enthusiastic about science and engineering by challenging them to design, build and race an electric car. The University of Ulster students took part in the regional qualifying heat based in Kirkistown racing circuit (Co. Down) 12th May 2018. Hunter donated race suits, polo shirts, softshell jackets and trousers for the 12 students who took part in this event. Pictured above (L-R); Jeff Hunter, Chief Contracts Officer at Hunter, Paul Doherty project leader University of Ulster, Courtney Gallagher, University of Ulster Green Power driver, Gary Holmes, Business Development Executive at Hunter and Sarah Clarke, also a driver for University of Ulster Green Power Team. The Hunter team is growing. Join us! Keep up to date on the latest from Hunter. Sign up to our Newsletter. My first name is This field is required. My last name is This field is required. My email is This field is required. Thank You. We’ll keep you posted. © 2017 Hunter Apparel Solutions Limited.